It's not too late to get involved with Clean Up Australia which is being held this Sunday on March 6th. You can either organise and register a site to clean up, join an existing site team or donate. To find out more and to register click here. 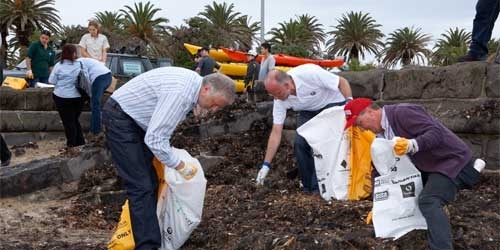 Clean Up Australia Day began in 1989 when Ian Kiernan, a yachtsman and builder, organised a community event to Clean Up Sydney Harbour. Ian was inspired to take action after witnessing the state of pollution and rubbish in the world's oceans after he went on a solo sailing adventure. What began with a community event has now turned into a national event, in which Australians have collected over 200,000 tonnes of rubbish in the past twenty years. However, it did not stop there. Clean Up the World, which was established in 1993 has involved 35 million volunteers from 120 countries, who have participated in tree planting, exhibitions, recycling and resource recovery, education programs, water reuse and conservation, competitions and fix up projects. To learn more about Clean Up the World or to get involved in your country, follow this link.